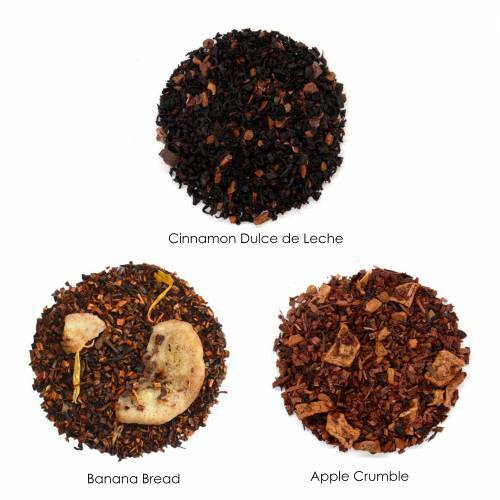 The Dessert Collection - Three delicious teas with a sweet desert inspiration. These teas have no sugars, but taste sweet, so they make the perfect sweet treat after a meal. A blend of black tea, cinnamon and a sweet caramely flavour. Naturally sweet honeybush that tastes just like banana bread. Warming cinnamon and the taste of fresh baked apple. Ingredients: Organic honeybush, organic cinnamon, organic apple pieces, natural essences. These teas can all be prepared with boiling water. Cinnamon Dulce de Leche should be infused for 2-3 minutes (up to 5 if using milk), Apple Crumble and Banana Bread can be infused for 5-10 minutes. We recommend trying all three without any added milk or sweetener first, then adjusting to suit your personal preferences. These teas are naturally sweet without any sugars. Have you tried A Decadent Dessert Collection? Tell us what you think!